Using The Jesus Deck Book now published. Happy to announce that Using the Jesus Deck has been published by Grove Books. Hope this will answer many of your questions about the use of this unique resource for sharing the faith of Jesus. What is the Jesus Deck? How can it be used for reaching people with the Good News of Jesus Christ. The Jesus Deck is a set of 52 + 2 (the Jokers) cards originally designed as a Christian education tool in the 1970’s. It has been published by a US games manufacturer, and was available on the internet. In the 1990’s some Christians realised that for many people outside the church the reading of tarot cards has enormous interest. While they could not in any way condone the use of tarot cards as future telling , they did see opportunity for talking to people and using them as a starting point. Using regular tarot cards they began to engage with people to share the Good News of Jesus Christ. As an alternative to using the regular tarot cards some of us started to use the Jesus Deck cards. They provided a useful tool for speaking to people about Jesus Christ in a flexible and accessible way in one to one situation. People who were seeking to find out more about Jesus could have a conversation based around the cards. The Jesus Deck has been especially useful in the context of Body Mind and Soul Exhibitions and local pub Psychic Nights. Groups using the Jesus Deck have grown up independently all over the British Isles. Until recently Decks were available on the internet but as the world wide stocks of the cards were used up the cost went up. It is not possible to obtain them at a reasonable price now. What does the Jesus Deck look like? The Jesus Deck of 52 cards and 2 Jokers is divided into 4 suits in the same ways as a normal deck of cards but in the Jesus Deck these correspond to the 4 Gospels. The pictures on the cards depict incidents from the life and sayings of Jesus. Each card has a picture from the life of Jesus Christ, a verse from the Bible, a title and is in full colour. Johns presentation of the Resurrection. What is the significance of the numbers on the cards? The numbers don’t have any real significance. The Jesus deck was originally produced as a children’s game and the numbers are a part of this. How can the Jesus Deck be used to speak to people who don’t know much about the life of Jesus? Does the Bible text on the card come directly from the title story? Not always. For example on Card John 4 the story is the resurrection but the text is a quotation from the first chapter of John. “The light shines in the darkness and the darkness has not overcome it.” When telling the story of the resurrection of Jesus I might say Christians see Jesus as the Light for the world and quote these words? Can I find a script for each of the cards so that I know what to say each time? Those of us who use the Jesus Deck don’t tend work like that. There is so much profound depth in the Stories of Jesus that it is possible to turn up a card over and over again for different people and tell the story in such a way as it come fresh for each one. For example the Luke card number 7 tells of the angels coming to the shepherds. Or I might speak of the glory of Heaven sent down to earth to celebrate Jesus coming, and how important it was that he came to be human. Or I might speak about angels as messengers of Good News from God. What significance do the colours on the cards have for the visitor? Colour symbolism is taken very seriously amongst those who attend Body Mind and Soul exhibitions. And colour is important and significant to us all. Thanks to Steve Hollinghurst for this summary of the meanings of colours. Most colours also have a range of meanings also so the idea is to get a feel for the colours in the context of the story and the way the picture looks. So below is my approach, but do as you feel led! Colour and picture need to be read together. Black – actually depicted on the cards as dark blue or perhaps sometimes as dark purple: - night; death; evil; darkness; ignorance; mourning. Purple/violet (but see above if obviously depicting night-time in a context where darkness and evil might be present):- royalty, both earthly power, but also divine authority; penitence; death as sacrifice. Light Blue (for dark see black):- heaven; truth; intellectual enlightenment; understanding. Gold:- divine presence; revelation of underlying reality; God’s glory. Grey:- ash; death; mourning; lifelessness. Red:- blood; sacrificial love; martyrdom; fire; the Spirit; passion - both positive and negative. Brown:- the down to earth everyday and human. Why did you want to reprint the Jesus Deck? Why not just get it redrawn by an artist and print your own deck? The Jesus Deck has become well known at Body Mind Soul Exhibitions in the British Isles this is one reason for keeping to the original format. To commission 53 pieces of original artwork of a high standard would cost as or more than having a reprint done. Are you trying to predict people future with the cards? No, we are using the cards to tell the story of Jesus and to introduce the visitor to Jesus as a person who can be friend, companion and guide for life. We are not telling people to do anything or that anything will happen to them. This is most important as some of the cards naturally refer to incidents to do with Jesus death. We don’t want people to look at those cards and see predictions of their own death or the death of those around them. They are about Jesus death and his offer of new life for us. We always make it very clear that - " this is not the tarot, it is not fortune telling or future telling. It is the story of Jesus on the cards. And it is looking for the places where his story touches your story. Where can I get training to use the Jesus Deck. Training opportunities by Penny Horseman and others are advertised on the Jesus Deck Facebook page(Penny Horseman can be contacted via www,tathana,com) The Jesus Deck will be available to buy, at these events. Penny will be available to do training at other venues. Contact her via her website. 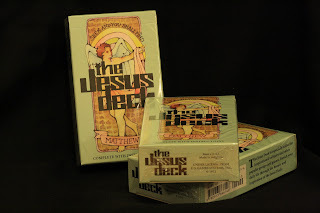 THE JESUS DECK HAS ARRIVED! After two years of work, a delivery of the reprint of the popular Christian outreach tool – The Jesus Deck, has finally arrived. Penny Horseman is delighted to announce this and gives thanks to God for his faithfulness and leading in this project. Price will be £25 including post and package within the UK ( for orders outside UK please ask for prices). Penny Horseman then working for the Church of England in Essex tracked the price of Jesus Decks for some years and was aware that stocks were running out. As someone who used the cards in her work with people in all kinds of situations and trained others to use them too, this was a concern. In 2010 she began to make enquiries about the possibility of a reprint. The Deck has now been reprinted and is available. Not always. For example on Card John 4 the story is the resurrection but the text is a quotation from the first chapter of John. “The light shines in the darkness and the darkness has not overcome it.” When telling the story of the resurrection of Jesus I might say -Christians see Jesus as the Light for the world and quote these words? The Jesus Deck has become well known at Body Mind Soul Exhibitions in the British Isles this is one reason for keeping to the original format. To commission 53 pieces of original artwork of a high standard would cost as much or more than having a reprint done. The Jesus Deck reprint will be available in the next few days. To find out more about how to use it see post dated 2011. There are some Jesus Deck training events coming up in Essex. The Jesus Deck will be available to buy. Penny Horseman then working for the Church of England in Essex tracked the price of Jesus Decks for some years and was aware that stocks were running out. As someone who used the cards in her work with people in all kinds of situations and trained others to use them too, this was a concern. In 2010 she began to make enquiries about the possibility of a reprint. The deck has now been reprinted and will be available. Why do you want to reprint the Jesus Deck? Why not just get it redrawn by an artist and print your own deck? As we launch the new copies there will be opportunity for some training events. The first of these are happening in Essex in April. Training is by Penny Horseman ( www,tathana,com) The Jesus Deck will be available to buy, at these events.